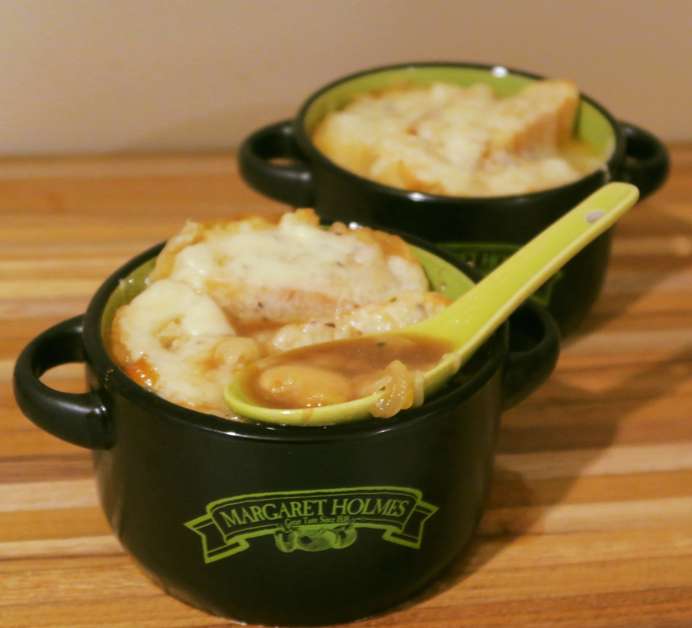 A traditional French Onion Soup with a twist. 1. Melt butter in a saucepan and add onions. 2. Saute for 15-20 minutes on low heat to caramelize, stirring occasionally. 3. Add wine and cook 5 minutes more before adding beef broth, bay leaf, thyme and garlic. 4. Simmer for 10 minutes then remove bay leaf, thyme and garlic cloves (discard). 5. Remove from heat and stir in butterbeans. 7. Brush bread with olive oil, place on a baking sheet and toast for a minute. 8. Ladle soup into the ramekins, top with toasted bread and sprinkle with cheese. 9. Place on even to melt cheese (about 3 minutes). *If wine is not used, substitute with 1 tablespoon white wine vinegar.